3 Beds/2.5 Baths, Open Floor Plan, Front/Back Porch, Sea/Mountain View, Gated Community, Pool/Pool House. Financing Available! 5 bedrooms (Includes Master).3 bathrooms.Walk-In Closet and Cupboards.Open Floor - Plan.Freehold Land of approximately 5,400 Square Feet.This property comes fully equipped with all the desired comforts and amenities associated with 21st Century Suburban Living.Located snugly within the tresses of a contemporary, safe and inviting neighbourhood,the large structure affords its occupants spacious and comfortable settlement and daily enjoyment, in such a manner as only an Open - Concept Floor Plan can provide, and it caters amply to the needs of, in particular, Nuclear and Extended families. 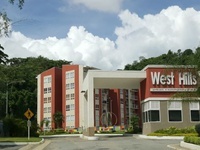 Bounded by The Nothern Range and the Churchill-Roosevelt Highway to the South, it is proximate to such highly patronized conveniences as Price-Smart Membership Shopping, The Piarco International Airport, Bhagwansingh Hardware's Flagship store, Piarco Plaza, Websource, Food Basket and The Arawak Chicken Depot etc.Select portions of its facilities can also be reconfigured so as to create space/s for any Purchaser who wishes to do so for the purpose of earning Rental Income. 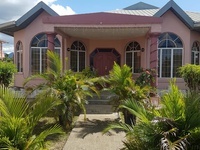 The property is well kept and has been in existence for just about fourteen years.It is a Must-see, for any potential buyer seeking the full extent of what this living experience affords. 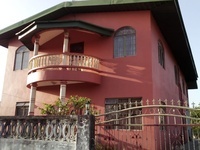 This cozy secure fixer-upper home is located in the lush hills of Cascade with beautiful views of Cascade, Belmont, Savannah, Port of Spain and the Gulf of Paria.The first floor consists of a spacious foyer which to the left, leads to five (5) bedrooms, 2 bathrooms, and laundry, while the right off the foyer leads to a spacious dining room, living room, family room, powder room, kitchen and porch with amazing views. There is a large two (2) bedroom, two (2) bathroom apartment on the lower level with a spacious living area and kitchen with additional space below to build an addition apartment.Peaceful, Secure and Cozy! 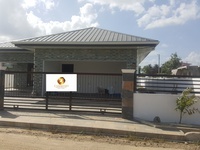 This beautiful newly built house is located in a up coming gated community off Madras road, just minutes from Piarco, Las Lamas, St. Helena and the heart of Cunupia.The house is beautifully designed with a lovely front gate, perimeter walls, large open living area with kitchen, washroom, 2 bedrooms with a shared bathroom and a spacious master bedroom suit with bathroom and walk in closet. 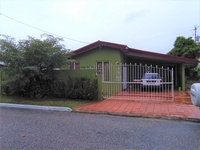 RS387 - This lovely Duplex is located off the St. Lucian road in Diego Martin within minutes from the highway, pharmacies, restaurants and many more.The compound consist of only 2 units with this one being ideally place to the front and consist of a covered car port, beautiful garden area, front porch which leads into the ground floor with a large open space for a sitting room, dining room and kitchen with a powder room to the side. The top floor consist of 2 bedrooms with built in cupboards and a shared bathroom, a study area followed by a large master bedroom to the front with a porch and a sizable walk in closet and bathroom.Spacious, Secure and Comfortable. 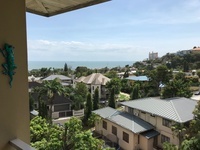 REF#: RS458This beautiful and cozy apartment is located in a building situated in a very private spot on a compound with eleven(11) neighboring buildings.This unit is located on the forth(4th) floor with views overlooking the car park and immediate hills around. The unit consists of; three(3) bedrooms, two(2) bathrooms, a sitting room, an open dining, and living room area which also leads out to a private patio, kitchen and a small washroom just off the kitchen.The compound has 24-hours security, a beautiful pool, a large hall area for private functions| events, a tennis courts, a play area and many other amenities close by. REF#: RS452This beautiful three(3) bedrooms, two and a half(2.5)bathrooms stand alone villa, is nestled in the prestige neighborhood of Good Wood Park, double gated with security and a lovely ocean view.This unit is approximately 3,013 sq. ft., with an upgraded open plan kitchen that flows unto a large deck that’s perfect for entertaining.An office that can easily be switched back to a bedroom, a master suite that includes a large walk-in closet, with his and her bathroom| vanities.There’s also a large communal pool with a lovely ocean view and lots of entertaining space.IN A COMPANY’S NAME. 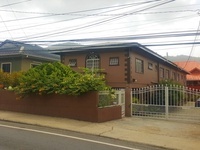 REF#: RS456Located within seconds from Saddle road (Maraval) and minutes from many businesses such as; pharmacies, groceries, shops, and restaurants is this beautifully finished home in a quiet and small residential area in lower Maraval.The home sits on a flat parcel of land approx. 9,600 sq ft with a lovely front garden, sizable pond with beautiful koi fishes and a pool with a spacious full bathroom and an addition en-suite bedroom.The main house is elegantly styled and laid out with a long walkway leading to the dining area, followed by a cozy study area. Then a private living room, and just off the study area is the large kitchen with stainless steel appliances, granite countertops, and a breakfast area. 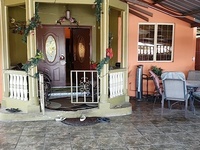 Off the breakfast area and living room sits a large porch with a built-in bar and off the kitchen leads to the enclosed garage and a washroom, while along the corridor are two (2) bedrooms, two(2) bathrooms and the master suite with walk-in closet. REF#: RS457This Beautiful two(2) story beachfront vacation/investment home is located in the quiet and peaceful village of Rampanalgas.It features a large living room alongside a large kitchen. There are three (3) bedrooms, two (2) of which are en-suite, one (1) of those bedrooms is the entire 1st floor. At least twelve (12) persons can be comfortably accommodated. 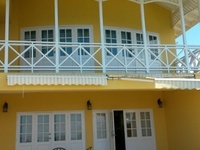 A relaxing Jacuzzi with a view of the Atlantic Ocean that adds to the beauty of this property. 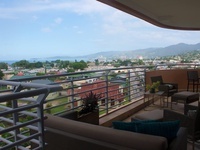 Recently updated Ocean View Condo located in Premier Gated Goodwood Park. 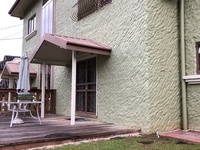 This unit is 3 bedroom/ 2 bath. Split unit AC's in all rooms. 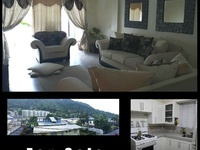 Stainless steel appliances include fridge, dishwasher, stove etc. Unit being sold fully furnished as seen including 2 queen beds with memory foam mattresses, dresser, end tables and coffee table, sectional couch, dining table, patio furniture with water fountain, 3 flat screen TV's, dryer and front load washer, Weber gas grill and smoker, water heater, water pump with carbon filtration and 1600 gallons water storage. 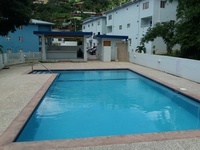 Community pool and 2 parking spaces included with 4 additional guest parking. 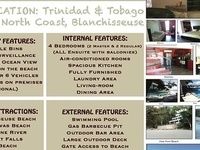 Owner is moving abroad and unit is being sold turn key inclusive of all dishes, glasses, sheets/ towels etc. 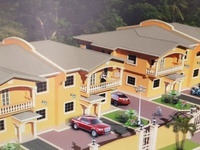 *Unit priced below market value for quick sale and any funds paid in USD will include a further discount on the price. 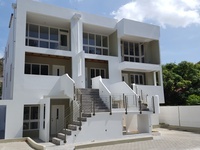 Two storey one bedroom apartment unfinished and deed available. 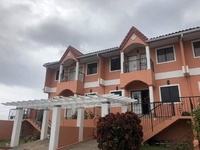 Santa Cruz House: NEW Santa Cruz House • 4 bedrooms • 3 bathrooms • Parking for 4 vehicles • 7800sqft of Freehold Land • 3300sqft of internal space • Master bedroom has a large walk-in closet • 4th bedroom downstairs with full bathroom • Independent laundry room • Family Dream Home. 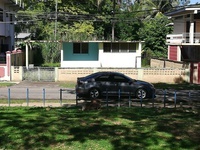 Located on the Southern side of Westmoorings is this single storey house in a small cul-de-sac within seconds from the Western main road an minutes from West mall, hospital, supermarket and many more. 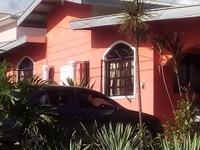 The house consist of 3 bedrooms 2 bathroom, an open living area, spacious kitchen area, washroom and covered parking for 2 cars. 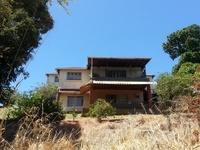 Great potential in a great location. Sorry no internal pictures allowed but viewings available with ease. 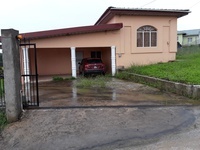 located approximately 5 minutes from the Fire Station is the property on a quiet dead end street with lots of potential to be use for a new residential home or business. REF#: RS448HALELAND PARK HOME FOR SALE.Situated in Grapefruit Crescent on approximately 7,500 sq. 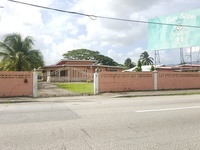 ft. of land with 3,800 sq. 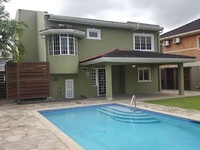 ft. of living space.This house consists of four bedrooms(4), three and a half(3.5) bathrooms and an outdoor swimming pool. A large en-suite master bathroom and a spacious walk-in closet.This home is ideal for family’s| Persons who enjoy entertaining with an open concept.The living and dining room area has a high ceiling with views of the kitchen, fully air-conditioned (AC) with in-door laundry room and secured covered parking for at least four(4) vehicles with an automatic gate. 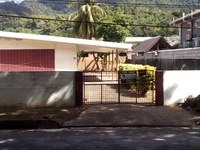 Situated in the Maracas Valley just approximately eight (8) minutes from the Eastern Main Rd is this spacious ground floor apartment in a secure gated compound. 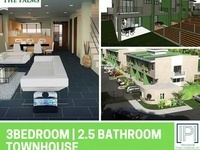 Ground floor 3 bedrooms one level Apartment. Consisting of;Living, Dining Kitchen, and Powder room.Master bedroom with en-suite bathroom.2 bedrooms with shared bathroom. Monthly maintenance $600.00. 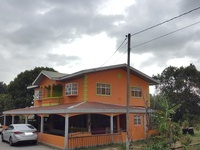 This lovely well kept five(5), three and a half (3.5) bath is located in the upscale safe and secure neighborhood of Cascade, approximately five (5) Minutes away from Port-Of-Spain.Downstairs:Four(4) bedrooms( built-in cupboards) two(2) full baths with an entertainment room with a kitchenette.Main Floor:En-suite master bedroom with walk-in closet.Large kitchen with store room, walk-in pantry, and breakfast area.WashroomPowder RoomOfficeA large private dining roomPrivate living room and porchThe kitchen cupboards are mixed with teak and pitch pine with tiles counter-tops, while the flooring throughout the house is mixed with tile and a wooden flooring finish. 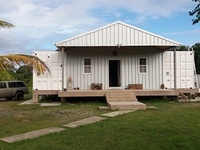 Constructed on four(4) acres freehold land, with three (3) 40-foot HC shipping containers, Approx. 1400 sq. ft. of living space and can sleep up to 8-9 people. Fully insulated durable eco-friendly alternative to local/ traditional building materials.Galvanized roof for solar panels and rain water catchment, 10 kW generator in shed. 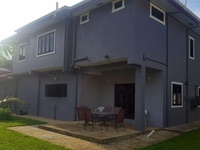 External Motion sensor (Solar) lights.Four (4) b/rooms-two air-conditioned, large air-conditioned meeting/entertainment room, one bathroom, a walk-in closet room, storeroom, walk-in pantry, kitchenette, living room. Comes semi- furnished. 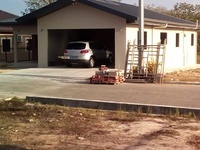 Water Pump, Water Tank, Security Cameras,Air Condition. REF#: RS305With breathtaking views of the Caribbean Sea, your own holiday or retirement this home is situated in the gated compound of Chupara, La Fillette, lies this 3 bedrooms, 2.5 bathrooms Townhouse. 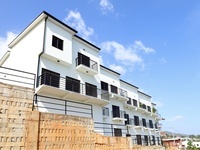 On the first floor, lies the master which has en-suite, built-in closets and air condition, whereas, the 2nd and 3rd bedroom have built-in closets and air condition. The ground floor lies the kitchen, living and dining room, laundry area and powder room. 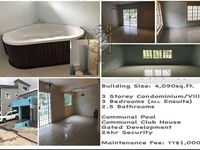 There is also a pool and tennis court on the compound.Building: 1,700 Sq. 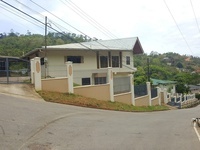 Ft.
REF#: RS331This Elegantly styled bungalow home is located Moka, Maraval. 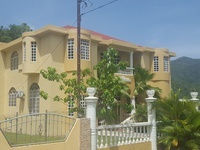 Three air-conditions (AC) bedrooms (master bedroom en-suite with walk-in closet), Living, dining, TV room and kitchen with high wooden ceilings and Laundry room along with a lovely porch which overlooks the gardens.The ground floor or basement comprises of Approximately 1,900sqft of space which leads out into the garden, this can be converted into an entertainment area and gym. 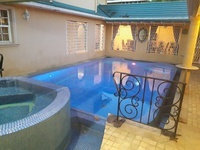 Great space to accommodate a pool.3,800 sq ft of living space which includes the basement and Land size 11,868 sq ft.
Diego Martin Apartment: This spacious 3-bedroom apartment is located within a secure, gated community. 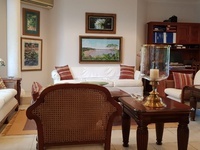 Its lovely gallery opens onto a spacious open-plan living and dining area. The kitchen has ample cupboard space and includes stainless steel appliances. 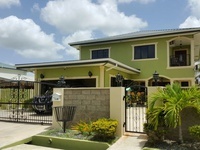 It is air-conditioned throughout and equipped with a surveillance camera security system. 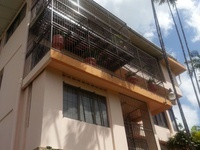 The compound has an attractive outdoor area, and the neighborhood is quiet and family-friendly. An excellent choice for a first home. REF#: RS263Nestled on the private island of Gasparee is this 40 year (Approximately) old home, which is full of character and boasts of a fantastic view of the Gulf of Paria. 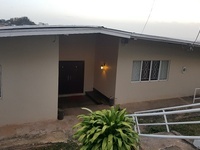 This three(3) bedroom house has an income-generating, self-contained downstairs apartment that can accommodate up to five persons. 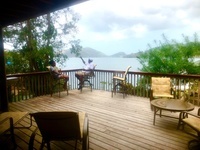 Also located on the island is a communal area featuring a tennis court, an island pool, and playground area. Apart from these amenities, there is a privately run restaurant serving cuisines which reflect the fine flavors of the Caribbean. 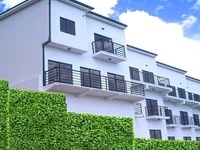 A maintenance fee of $500.00 is payable by residents to offset the cost of servicing the communal areas and the provision of security.Land: 7,500 Sq. Ft.Building: 3,000 Sq. Ft.
REF#: RS235Nestled on the hillside, in the quiet neighborhood of Santa Margarita, St. Augustine, lies this beautiful tri-level home.1st LEVEL consists of Master bedroom with en-suite and walk-in closet, large bay window with a spectacular view of the Southern Plain, 2nd and 3rd bedrooms with a shared bathroom and TV room that also has a balcony overlooking the Central Plain.2nd LEVEL consists of dining room, sunken living room both of which continues with the spectacular view of the Southern Plain, 1 bathroom and a 4th bedroom that can be converted into a study room/office. 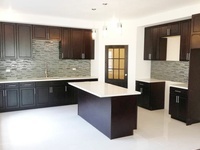 The kitchen is outfitted with teak cupboards and leads out into a covered area which would be perfect for entertaining. 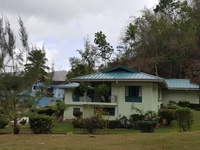 There is a staircase leading down to an open porch with lush landscaping and garden bearing fruit trees such as limes, oranges, mangoes, and grapefruits.3rd LEVEL consists of a 1 bedroom studio apartment with its own separate entrance.BREATHTAKING, PEACEFUL AND RELAXING.Land: 15,307 Sq. FtBuilding: 6,000 Sq . Ft. 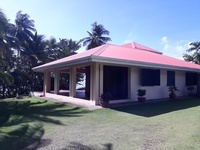 The House is Waterfront aprox 2500 Square Feet three Bedrooms, three Bathrooms plus separate apartment and two large Decks and private Dock etc. Million dollar view down the first Boca. The Land is Freehold Title and Deed. 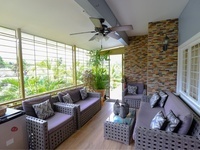 Everything is new fully furnished the entire house is constructed of "Teak Wood" built with Stainless Steel Hardware and Epoxy etc. It has a Water Maker with plenty of water storage a Laundry room and two Pump rooms.outside. 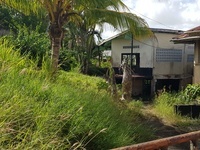 The yard has Mango trees, Coconut trees and a Fish Pond in the back. To see the house just call me. It is a turn key set up ready to go with no work needed!